The Australian Women’s Weekly is an institution. Since 1933 it’s been covering, in a gentle and non-threatening way, the public figures of Australia, not to mention providing recipes, dress patterns, advice and occasional facepalms. Like many Australian women, I grew up with it. I was therefore delighted to discover that the 1933-1982 archives are available online. This is (a) amazing and (b) completely unhelpful for my needs in terms of researching the novels I want to write. Of course, interesting stuff did happen between ’33 and ’82. Like, oh, a bunch of wars. And also we lost a prime minister (May The Sea Return Him). 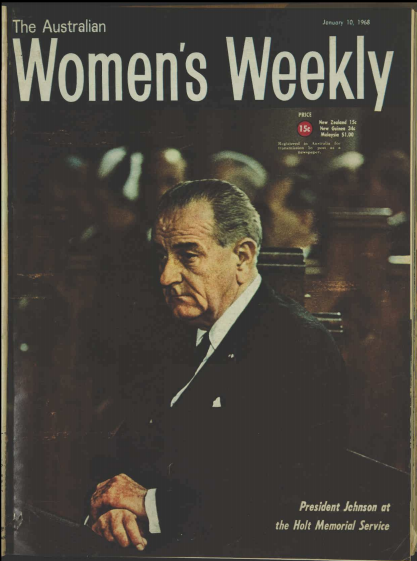 How did The Australian Women’s Weekly cover the funeral of a prime minister who died in office?